Chris Auman and Kelly Brown of Sanctuary Marketing Group, in North Canton, Ohio, were invited to TV 11 with Doug Lane of the North Canton Area Chamber of Commerce Main Street Exchange to discuss the growth of their company and the different avenues of digital marketing (SEO, Website Design, Graphic Design, Analytics and Statistics, Social Media Marketing and much more). North Canton is growing dramatically. The expansion of local businesses and renovation of downtown’s historic Hoover District has caused quite the buzz and excitement for those who call North Canton home — including Sanctuary Marketing Group. Please take a moment to watch Doug Lane of the North Canton Area Chamber of Commerce interview Chris Auman and Kelly Brown of Sanctuary Marketing Group. Get to know our company and our services in case you ever need help with digital marketing. Doug: Welcome to Main Street exchange presented by the North Canton Chamber of Commerce — North Canton City Schools TV 11. 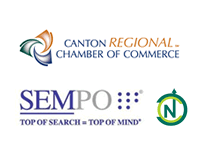 These programs focus on economic, educational, governmental and community issues directly impacting North Canton and the surrounding area. This addition to Main Street exchange looks at a new business located in the Hoover District but not a new business to us, the Sanctuary Marketing Group. Our guests are Kelly Brown and Chris Auman. We want to welcome Kelly and Chris to the Main Street Exchange — Good morning! Doug: Let’s talk little bit — Periodically we do these programs with entrepreneurs. We want to find out what started the whole idea and how things develop. I mentioned that you are new to the Hoover District but not necessarily new to our area. You were just north of town for a while. Tell us about how Sanctuary, what used to be media group and now marketing group. What are the origins? Chris: I ended up working at the Akron Beacon Journal. This is back in the day when the Commercial Internet was kind of just getting started. I thought this is something that I really like to get involved with. So worked there for about 10 years getting their website, [www.Ohio.com] up to speed. We did all kinds of things to figure out how to make money with the Internet. We started to develop websites for clients, so that they could advertise on the site. All those kind of things. There I learned a lot about Internet marketing, developing websites and things like that. It is kind of became my life doing that. So eventually I broke from there, started my own business and grew from there. Doug: Okay and then you linked up with Kelly at some point in time. Kelly: Yes, we have been friends since the fourth grade. So we have known each other for years. Our careers went different tracks but we have always kept close in touch ever since high school. It just came up with the opportunity. I was working with a publishing firm doing the marketing directing there and a number of other things. Just the opportunity came that he was growing. I was looking for an opportunity, we started working together and now we are business partners. Kelly: So we’re very happy. We are a good partnership. Doug: So how long has Sanctuary been around? Chris: It is going to be about nine years. Yes. Doug: Before moving to the Hoover District you were at North Main just past Family Video but were you somewhere before that too? Doug: So, this is your third move? Doug: Alright, so you were working out of your basement basically. Chris: Yes every business has to start somewhere. Right? Doug: Well in your business | We were talking yesterday at a meeting about how used to have to dial up the Internet. If someone else picked up the auxiliary phone you would lose your connection. Things like that. Doug: That was not that long ago. I can imagine that over nine years time what’s happened with your industry. The movements that have taken place and the fact that somebody could basically do this out of your car not as well as you could in an office space having the resources available but it is pretty easy to get on, start doing code and doing websites. So how do you differentiate yourself and keep up to date with all these changes that are happening almost every day? Kelly: That is the challenge. There is a number of people. They are a lot of competitors that’s because the barrier of entry is very small. But it still has to do with — do you understand how to grow a business? Do you know how to market? There are a lot of people who know how to program. There are a lot of people who know how to do “SEO” (whatever that means). Our job is to help businesses grow and our difference is that we are accountable to results. We understand marketing. We understand that unless you have a website that helps grow your business — and that means leads being generated or sales being generated or people coming into the store — then you are not going to continue to invest in it. We are able to draw end results to the activities that we are doing and that is, I think, our differentiators. That’s what I think business owners react to the fact that we are accountable to results. We can show them how the things that we doing are helping them. In the end that is the only way that they will keep investing in us is if we can prove that will valuable to them. Doug: So a business owner can go out and create his or her own website. That is not hard to do and you can get is hosted. But having the follow-through and all the things to be done, that’s where you folks step in. Doug: Sure and you can do them as simple or as complicated as someone wants them to be. Who are some your clients? Chris: We have clients all across the board. I have clients from some of the very early days. We have physicians, musicians and all kinds of people. It is all across the board. But we work with local companies even like [Aden fresh markets]. All the way up to large national companies like YRC Trucking. Kelly: We also recently signed up Ohio specialty vehicles, OBS Specialty Vehicles which does blood mobiles and bookmobiles locally. Inn at Belden Village — so there is a number of local businesses that will working with. Ferriot, which is a manufacturer. It is all over the board with manufacturers, small retail chains, large retail chains and industrial. Doug: All of this is coming directly out of the Hoover District. Doug: If people can imagine: When you walk into that 219. Once you can finally get to the 219 building; As we are taping they are still doing work on Maple Street. But when you going to the 219, you are on the left-hand side. Okay, so it is the old Mr. Watch location. Doug: That is for people who have been to the building before. What made you choose North Canton? Chris: Well both, Kelly and I, have lived here for over a decade. All of our kids go to school here. We go to church here. It’s our home so we wanted to just be a part of the community. When we find out that they are really making efforts to develop the Hoover district we really got excited and kind of wanted to be a part of that. I think the things they’re are saying that they are going to do in that area are just going to be amazing. We just want to be a part of it. Doug: You got a long-term lease if I remember right? Kelly: Yes we do. We are there 10 years. I hope to stay there longer. I do not want to move again. Doug: I do not blame you after three times. Doug: It is better than his basement. Kelly: Yes it is better. Chris: Well my basement is pretty nice. Doug: I remember when it was a field and a tree. Doug: And then to Hoover building. Kelly: Now we got these restaurants coming in. So there are all these people working. Quite frankly, we are both small-town people and we always have those big city dreams. This is kind of the best of both worlds. We get to work and live in a small town yet we have this building where there is a lot of activity. There are people around. You can go to the local restaurants to eat. It’s just so much around here that we love living here and working here. Doug: Sure. And how big is your company now? I know you have some growth coming. Where are you at right now? Kelly: We are 15 and hiring our 16th person as we speak. Last year we were eight people at this time. Doug: Okay and you’re in the process to or is this post merger. Kelly: This is post merger where we are at. Yes. Doug: That’s because you are looking. The last time we chatted you are getting another company under your umbrella. Kelly: They are with us. The date of the move-in was the date of the merger. So it was perfect timing. We worked with this company for years. So I’ve actually been a customer of theirs and they’ve been a customer of ours for years. We are very closely collected with the team so this is a natural connection to start working with them and it’s just been great. I couldn’t say enough about it of the timing of everything coming together. The people coming together. This a good type of excitement and morale kind of thing going on. Doug: You talk about other firms too. We have a number in the chamber with Innis Maggiore Group, Covey-Odell Advertising Ltd. We got a number of solo operators that do a great job of that basement still. You folks all work together share leads and things? Is it as cutthroat as some industries are? Kelly: Well it is competitive see you have to be good. Certainly we’re going to see business from other competitors and they are going to see business from us but ultimately we are pretty friendly. We really try to stay focused that’s because we can do print media, we can’t do a lot of things that another. Just like you said the industry is changing so fast. We’re staying focused on digital marketing. So unless we stay in that niche were going to get distracted by all of these things. Our focus is really what helps us. While it is competitive it is not cutthroat. We worked pretty well with the number of our competitors. We subcontract with them and they subcontract with us. There’s plenty of business to go around. Doug: The digital markets, does that also includes social media? Kelly: It does. It includes website development, website design, search engine optimization, pay-per-click (PPC) and social media. Yes. Doug: Digital media we’ve been talking a lot about and that is especially but does it also includes social media? Doug: You’ve got so many different options available on social media. Chris, how do you get a company, an individual or a magician into that area. What are you looking for to help them. Chris: Well, it’s like he said. There are a lot of different things that companies could be doing. One of our big things that we do is strategy. It is our job to help a client by guiding them to what they should be doing or what they should not be doing. Social media is specifically not right for every body. So it is our job to go in there and tell them if they should be doing it and guide them on how they should be doing it. With all the tactics, I think that is one of the things just like you talked earlier about how… (How do I want to say this). Our job is to guide our clients and with social media we have people on staff who are experts at that – who can come in and help define a specific strategy for people with how to deal with that. It is more than just setting up Twitter and just start throwing stuff out there. Chris: There is a strategy so all these things and how to do them properly. Doug: Facebook is almost the old timer on the block now. Right? It’s been around a while, so I would think that everybody you suggest to have a Facebook page. Kelly: Not necessarily it varies. Facebook is very good for B to C (B2C) type of customer relations. LinkedIn tends to be better for B to B (B2B) — People who are looking for project managers. That’s because when we work for manufacturer to have a Facebook page does not really vibe with them so to speak. They go, “I don’t know why I need it”. But it may make sense for establishing a culture, establishing your personality. You not going to make a big sale off of that. But from LinkedIn you can have a connection. The strategy is a little bit different in the fact that you try to grow your contact, to set yourself up as an expert in your industry and build connections. From there, they all have different approaches. They all fit in whether it is social media, Facebook, Twitter or whatever those things are. There is a strategy for that and then this a top level strategy overall of what you’re trying to accomplish with marketing. If you have the total marketing then you understand where the digital marketing fits and then you figure out where the social marketing is. Our fear is in one of the things that we run into a lot is people say they want a Twitter strategy or a Facebook strategy and those are tactics. It has to fit in to what are you trying to accomplish. Doug: Even the chamber has Twitter. I don’t think I’ve posted anything on there for a year. I just do not have the time. We do keep are our Facebook updated. In our world Twitter isn’t really something that a chamber of Congress really needs. It is nice to have but it does not need it. So we are probably a good example of what you’re talking about. Kelly: But an argument could be made for both. I think it really depends on your business on your industry and what you’re going to use to measure success. I think a lot of times people start down that track and we ran into so many people who have twitter. He and I have different… He loves Twitter. I am not so much a twitter guy. So it is a personality and where you going to relate to. The good thing is if you measure and figure out what should be happening then you can keep interested in it. If you are just | a lot of people start in spurts and then nothing will happen. Well they think nothing is happening and then they will abandon it. That is just wasted effort and resources. Doug: You talked about SEO, Search Engine Optimization. How do you … I will suppose that Google is the big dog? Doug: But you’ve also got things like Bing and Ask Jeeves. I do not know if that is still around. Yahoo. Do each one of those particular search engines had different codes and things that you have to deal with. Kelly: They do and the world of search has kind of changed as well because he used to be a lot about technical, “are you programming it right”, “are you feeding in things” and that is an aspect of it. There is the technical mumbo-jumbo that goes into making sure the search engines can find you. You’re presenting your information correctly but ultimately what they all want is someone who is searching for something from this site to find the most relevant information. So, if you have relevant information and you are presenting it in the right way that helps you communicate with your customers. You’re going to do well. It just about investing in the right areas. Understanding what your market wants. Is no different than any other marketing. I don’t think is changed since Dale Carnegie. It is who you are talking to. Doug: You might have to Google that one. Doug: It is been a while. Kelly: But I do not think is changed. It is how to win friends and influence people. You present good information, you present it in a correct way and you will do well. But you have to think through who your customers are, who you want them to be and from there you can build a successful online marketing campaign. Doug: How do you take your customers into the mobile realm of iPads, smart phones and what do they call them now, phablets? Doug:… And other things. I heard at a conference that one of the fastest-growing markets for phablet is 65+. They want to do to communicate with their grandchildren and find out what the next golf game is going to be and everything else but they do not want to deal with a small phone. So, how do you take too a customer and say you have to be all of these platforms. Kelly: You do. The biggest case is — what I would say with anybody who has a website for their business. Unless they have something like Google analytic, which is a free tool that Google has that lets you monitor who is coming to your site, that would tell you what your percentage of visitors are that are mobile users. We’re starting to see people anywhere from 25% to 40% and sometimes 60% of the visitors coming from mobile. So makes the business case of if people can’t see your site. Then you take a look at what this site looks like on a mobile phone. So that makes the business case of do you want 25 to 60% of your people to see it. The good thing is there is something called responsive design and responsive design is if you break it down it is pretty much what it sounds like. Depending upon what device they’re on, it responds and presents the right thing to it. Is not about building a different site it’s about figuring out what is going to look like on a tablet, on a phone and making sure that you made those decisions and prioritized the type of content so that it presents well on those different devices. It is a little technical but ultimately one site should serve them all. Doug: One of the platforms that I hear an awful lot about now is WordPress. Kelly: We are heavy into WordPress. Doug: Is that something which is taking over the world? Kelly: What was the statistic about 23% of all sites are on WordPress. Surely that is going to include a lot of independents. There is a lot of volume of that but people like the New York Times. They are large sites on WordPress. Doug: Maybe explain to the viewers what WordPress is all about. Chris: WordPress is a content management system (CMS). Which is kind of the backbone of your website. Everything is built on that and is very much like a Microsoft word kind of interface in the background. So anybody can log in and make changes to their website, to make things bold and make links. It is very intuitive. It is just the backbone of your website. It is software. We love it. We built all of our websites on it. The good thing is our clients are not locked into any kind of proprietary system. If they wanted to they could pick it up and put it onto another server with someone else and go. A lot of our competitors sell homegrown content management systems (CMS) that have to be paid for and continually maintained. There is a monthly or yearly fee. That kind of stuff. We really don’t like to have our clients married to something like that. Doug: They do updates quite often don’t they? Doug: Is it kind of a freeware type of things where people can come in and change things? Kelly: You want to guard against that. You want to be careful about how it goes out. Chris: Really, the good thing is that it allows us as a company to provide much more affordable services for our clients because it has a lot of the bits and pieces build in. A lot of things we can pull off the shelf and plug it in. We go were some other companies will build all those things from scratch and therefore it will cost a lot more money. Doug: So that helps the bottom line and everything you do as well right? You talked about almost doubling in size. Obviously you want to try to hopefully keep growing. Where do you get your folks? Do you look local first or do you look national first? Kelly: Well, our business is to help businesses attract business. So, they come to us. Our business is 100% inbound. We are focusing on the local market. As I said, “We are local people with local business who want to serve the local market”. That is our focus. Doug: How about employees? Where you draw from? Kelly: Most of them are from North Canton. Some of them are Canton. I think we have one that lives in Bolivar. A couple people are in Copley but they are all local. They are all from around here. Doug: Okay so if you got a Kent graphic design student or somebody from Walsh or even from Hoover that graduates then you would at least entertain them dropping you a resume and letting you know that they are available? Chris: Always looking for good talent. Doug: Well if somebody wants to get in touch with you, Sanctuary Marketing Group. They might be listed somewhere as Sanctuary Media Group because that was your older name before you moved. They can find you in the 219 building on East Maple. Where do they find you on the web and how they contact you in the old days on the telephone. Kelly: Sanctuary MG as in www.sanctuarymg.com. Then it is 330-266-1188 (phone). Doug: Okay we appreciate both of you folks being here today. First of all we appreciate you coming to North Canton and growing in North Canton and being a part of North Canton. Looking forward among with everyone else says in North Canton but also being on the program today. Hopefully people have learned a little bit not only just about your business and entrepreneur ism but also what your business is. Doug: Thanks for being on Main Street exchange.